Harry Potter is the best in the whole wide world, I own ALL of the books AND the movies. I wish Harry Potter would never end!!! 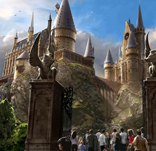 the ride seems like its going to be good.but may not be for the much older crowd.the park is going to be nice.but they should add more rides and maybe a stunt show based on the potter movies.just an idea.anyone going to try the butter beer or pumpkin juice.